Today I take you away to sunny France. Land of fries. I saw this book round about a year ago, but I hadn't actually gotten around to checking it out until now. It's a lovely little thing and just about one of the most pleasant stories I've had a chance to peruse in a while. If you know Anthea Bell, you know her for one reason. She's the woman who translates almost all of Cornelia Funke's children's fiction. If you know the artist Sempe you also probably know him for one reason. He does those delightful little covers for the New Yorker that strike everyone as utterly sublime. And if you know Rene Goscinny then you are probably French. There is no other explanation for it. Even though Mssr. Goscinny created "Asterix", has won multiple awards for his cartoons, and became (according to his bio anyway) "an internationally successful children's author", he's not exactly common knowledge here in America. In fact, if you were to stop your average joe on the street and do a little free association with the words, "French children's books" you're going to get two kinds of answers. They're either going to say, "Little Prince" and start reminiscing about 9th grade French class, or they're going to say, "Tintin" and then rush to the nearest bookstore to read them. It's not Goscinny's fault. He was never properly introduced to American children before. Now all that has changed and it's thanks to, of all publishers, Phaidon. Yes, the company that usually prefers to publish glossy glorious art collections with titles like, "The Photography Book", has now dipped its toe into the murky waters of children's literature. With translations, however, they're fairly safe. "Nicholas", originally published in 1959, remains a uniquely droll little series of small boyhood adventures. Nicholas attends an all boy's school somewhere in France. Where he lives is not especially important. What is important is that he and his friends often have ripping good times, much to the dismay of a variety of authority figures. As the book goes on, you come to know certain characters particularly well. There is the teacher's pet, Cuthbert, of whom we are told multiple times, "Cuthbert wears glasses so we can't pound him as much as we'd like to". There is Eddie, who would love to do the bulk of the hitting, and Alec who is always eating. Geoffrey has a father who is rich and who buys his son all kinds of expensive costumes and Rufus has a dad who's a policeman. Then there's Nicholas himself. He's just your average kid, sometimes running away from home, sometimes playing hooky, and sometimes driving his poor mom insane when he stays home sick from school. Collected as a little book of nineteen different stories and illustrated with aplomb by the irresistible Sempe, the book is both beautiful and incredibly funny. It's one of those titles that would make for wonderful reading aloud, whether to a class of rapscallions equal to Nicholas's crew, or one-on-one with a child before they go to sleep. The nice thing about the book is the way in which it conveys ridiculous and downright insane occurrences with as understated a manner as possible. There are countless fights between thirty+ boys, usually ending with Nicholas saying something along the lines of, "and we were having a really fabulous time!". Sometimes, however, the jokes are so sublime you could miss them if you weren't paying close attention. When Nicholas wants to buy his mom some flowers for her birthday, "I took all the money out of my piggy bank and luckily there was a lot because quite by chance Mom had given me some the day before". Another great moment comes when Nicholas's parents promise that if he comes in the top ten in the math test he'll get a bike. He does, "because there were only eleven of us doing the test, all the rest of the class was away with colds, and the eleventh was Matthew who always comes last anyway, but it didn't matter for him because he's got a bike already". Goscinny has a penchant for run-on sentences, as you can see. Credit Anthea Bell's translation, then. She conveys both the subtle humor of the book as well as the author's long, rambling, but ultimately satistifying sentence construction. After you read the stories through, you even begin to pick out little patterns here and there. 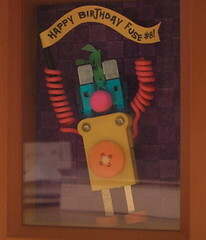 It seems to me that Rufus is excellent at getting all his friends in trouble, but he rarely gets caught himself. And Eddie may hit other kids a lot, but his home life doesn't sound too keen. How much of this book owes its popularity to Sempe, I have to wonder. Certainly the illustrator's work gives "Nicholas" just the right kind of levity. If you've never had a chance to see a work by Sempe, this book will come as an unexpected treat. Using the thinnest of pen lines and the occasional inkwash, each picture is a misleadingly simple and loving work. 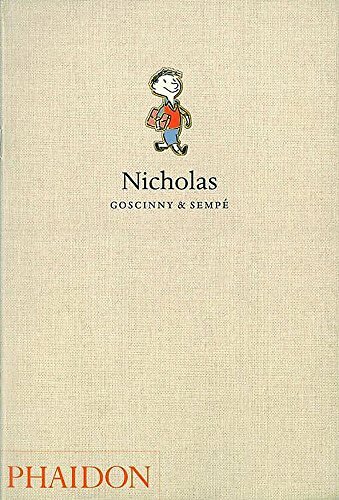 Written in 1960, one goes through the book in fear that "Nicholas" will contain moments unpleasant to our contemporary ears. "Tintin", after all, doesn't come off especially well these days. But except for the odd reference to Indians and kids getting slapped by their parents, "Nicholas" holds up pretty well. Some parents may be shocked at how often the kids in this book fight at just the slightest of provocations. It's worthwhile to note though that not a single kid ever seems to get injured in the process. There are plenty of punches and kicks, but you get the general impression that very few of these actually connect. Some people would moan that there are very few girls in this book. Be that as it may, the one girl who does show up (Louise) faces down Nicholas on his own turf and beats him time and again in playing with his airplane or soccer. Does he get mad at her? Not a bit of it! When Louise manages to kick a soccer ball through the garage window he doesn't get any supper that night, "but I didn't mind. Louise is great! We'll get married when we're grown up. She kicks a really fantastic goal!". It's nice to find a new children's classic. Something that will really inspire great love over the years. And with Phaidon giving it packaging that's bound to last for years and years, "Nicholas" shall be appreciated for generations. A great book, a great combination of artistic talents, and a wonderful find. Le Petit Nicolas is the best ever! I was so sad when I finished the last one. If you like Nicholas, you mshould definitely read the Italian equivalent: Gian Burrasca. Has that been translated into English yet? Ooh! Gian Burrasca, eh? Doesn't ring a bell but American publishers are notoriously slow when it comes to translating overseas classics. Who's the author? It was written by Gian Bertelli around the turn of the century and oddly it doesn't look like there's a commercial transation. That'll give you the idea. I will be very durprised if this has never been published in English. It's THE children's book in Italian. Doesn't look as if we've anything by the fella. Recently my Italian patrons have been complaining that we have way too many French books and not enough Italian. They point out to me that there are tons of Italian-Americans living in New York, and far fewer French-Americans. They have a point. So if we ever get to buy some Italian items, I'll certainly recommend Bertelli. But when it comes to translating enormously popular children's books overseas, American publishers don't care a jot. a american knowing René Goscigny is a perfect woman!